Happy Holidays from the Sandbar Staff! 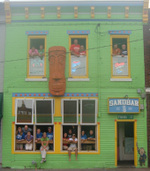 It wouldn't be a holiday without a Sandbar staff-themed JibJab video. Have a great holiday season! We'll most likely be open on Christmas Eve and Christmas night, but not until later. It depends on when staff wants to open up. Pay attention to our Facebook page or Twitter account and we'll keep you posted. We're back with more fun JibJab Halloween videos, starring our awesome staff! First up: chills, spills and thrills with zombie party, featuring Joe, John and Danny. Next, the Monster Rap, starring Phil, Hayley, Tegan, Coleen and Fyler. Check out JibJab and make your own fun Halloween video cards! It's almost as fun as getting candy at the door. Some of the Sandbar crew headed out to Alvamar last Thursday for the fifth annual Spurling Scramble, the annual golf tournament put on by the Lawrence Police Officers Association, Fraternal Order of Police and International Association of Firefighters. Proceeds from the event benefit SAFE, the Surviving Spouse and Family Endowment, which provides funds to families of police and fire personnel killed in the line of duty. "Violet's Valor" bracelents were also available to purchase, to help support a local family's expenses while their daughter fights leukemia. The Sandbar sponsored one team of golfers: Phil, Joe, Tyler and one of Tyler's friends. Dave did what he does best- dispensed shots to golfers and took pictures of them in the Sandbar beach-themed cutout. He also got to hang out with Karen and Kalissa, which is probably the real reason he opted for that job instead of golfing. Andrew's other employer, adidas, also sponsored a team. Andrew and Tegan played on that one along with some guys Andrew works with. The adidas team won first place in the second flight, and the Sandbar team won second place in the second flight. We've got trophies to prove it! It was super windy that day, but at least it didn't storm. Everyone had a great time, and we always enjoy supporting great causes like this one. Check out our Facebook page to see pictures of golfers with the photo cutout. We had a great time at the United Way's Campaign Kickoff Carnival! Our bag toss games kept a bunch of kids entertained in the corner. We handed out a few free Sandbar t-shirts, too. Everyone at the event got free Live United t-shirts, and then the crowd gathered in the main area for a group photo. Some of us are a little disappointed that the venue change meant there wouldn't be a pie-throwing contest. Dave was volunteered to be a target, and we found out earlier today that Friday bartender Phil was also going to be in it. Someone was watching out for them! Here's a few pictures of us clowning around at the event. If you've been around Dave much, you know how he likes to take these circle group photos. We all put our clown noses on to pose for a picture, and then we took turns in the pirate and mermaid cut-outs. We're proud to be a part of community events like these. The lovely Heather was tending bar with Phil on a Friday night, like usual. A female customer approached the bar and told Phil she wanted to talk to the girl bartender. Phil said "sure, Heather's right here." Heather walked over to see how she could help the woman. "No, " said the customer, "I meant the NICE girl bartender." Ouch! Turns out, the woman wanted to speak with Coleen. Who is certainly a nice bartender. But we happen to think Heather is, too. Just one of the many funny things our bartenders hear on a daily basis. This picture mysteriously showed up at the Sandbar one day last week. Doesn't it look like a 70's version of Joe?!? But that's definitely not his gorgeous fiancee' Teresa. Maybe Joe is really a lot older than we think...or maybe he secretly dresses up in cowboy attire when he's not at work. Any guesses as to who's in the first picture? UPDATE: It's Phil in the first picture. We aren't sure who dropped off the picture, but it appears to be from a collegiate event from Phil's days at Kansas State University.